Experience Berlin from the water on this 4.5-hour sightseeing cruise along the Spree river. Cruise from east to west on a historic steam ship past many of the major sites of the city. See Charlottenburg Castle, the largest castle in Berlin and one of the city’s most famous sites; Bellevue Palace, the official residence of the president of Germany; the House of World Cultures, Germany's national center of international contemporary arts; Berlin Hauptbahnhof, the main railway station in Berlin; the Regierungsviertel, also known as the city’s Government District and much more. 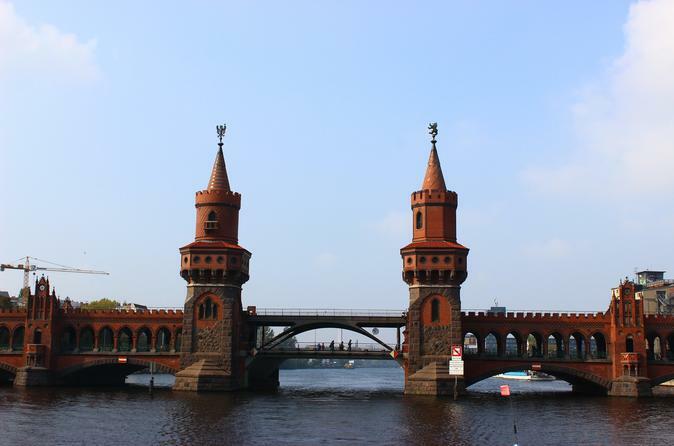 Begin this entertaining tour of Berlin from Lindenufer, in the center of Berlin-Spandau, where the Spree river flows into the Havel. Climb on board a renovated, historic steamboat with modern comfort for this exciting tour from east to west through the city. The boat was built in 1909 and rebuilt in the 1950s. It provides outdoor seating on both the front and the upper decks, with optional seat cushions and blankets, as well as plenty of seating inside and on the back deck. There is a bar, featuring drinks and snacks, plus restroom facilities on board the boat. See many of Berlin's most popular sites. The boat ride visits the fairytalesque Charlottenburg Castle, the largest castle in Berlin and one of the city’s most famous sites. Also, see Bellevue Palace, the official residence of the president of Germany; the House of World Cultures, Germany's national center of international contemporary arts; Berlin Hauptbahnhof, the main railway station in Berlin; the Regierungsviertel, also known as the city’s Government District; plus the inland ports of the Berlin-Spandau Ship Canal; Westhafen, the largest Berlin harbor and much more.